I took this image from the Müllner Steg in June, 2008. 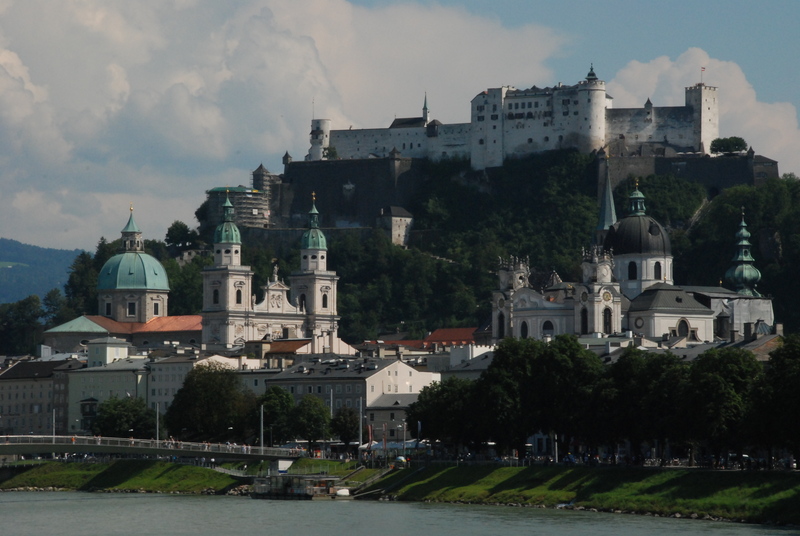 The last time I was single, I lived for a couple of years in Salzburg, Austria. I love that city and I’ve made a number of return trips over the years since 1978, the last year of my more-or-less permanent residence there. I love that city not just because of the friendships that formed during my time there, but also because of the atmosphere of antiquity which seems to emanate from the very stones. Of course, like anyone who lives in an amazingly picturesque location, I constantly saw scenes I wanted to capture in photography. And like anyone who has visited this birthplace of Wolfgang Amadeus Mozart, I had an ongoing fascination with the cityscape of the old town. My favorite perspective on Salzburg is from a bridge called the “Müllner Steg” that spans the Salzach River just north of the city. I took dozens of pictures from that vantage point while living there and each time I return for a visit, I make my way through the tight, winding medieval streets to the banks of the river to compose more photos of one of my favorite subjects. 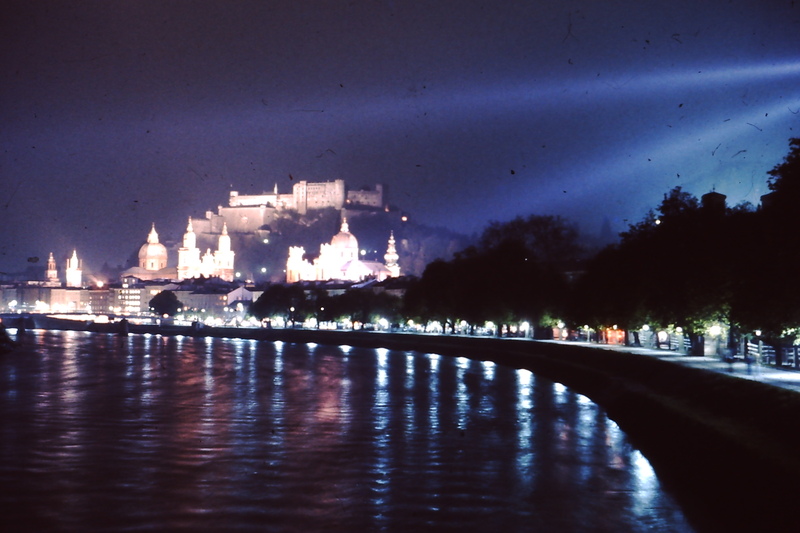 Salzburg has more cloudy days and nights than clear, so when a particular evening in May, 1978 settled in with cloudless skies which coincided with a full moon, I knew I had to get to the Müllner Steg as quickly as I could. As I walked out on the bridge span with my camera and tripod, amazement seized me. 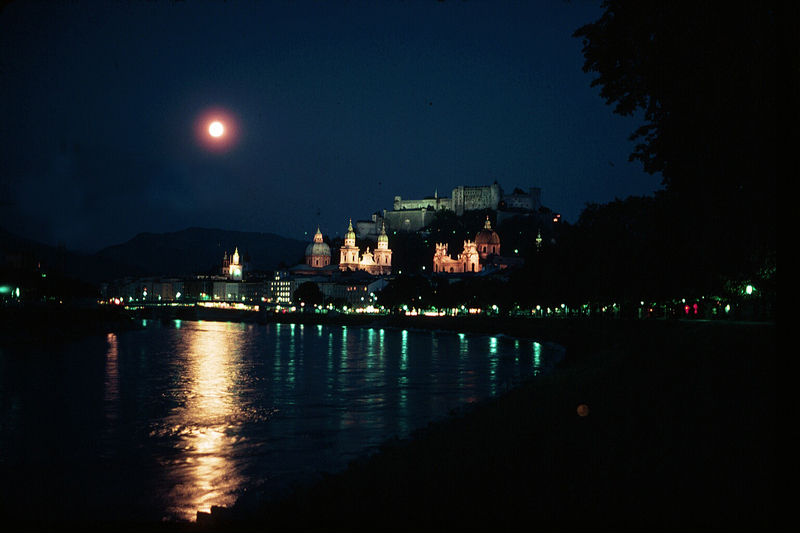 A full moon sat suspended in a velvet sky reflecting off the calmly flowing waters of the Salzach. This was a rare moment and I had an opportunity I knew would never come again in my life. I set up my gear and shot – and ended up capturing one of my all-time favorite photos. Photographers will tell you that many of their great photos occur this way. You’re in the right place at the right time. Coincidence? Well, not exactly. You see, I’d lived in Salzburg for two years prior to May, 1978. I’d crossed the Müllner Steg many times and frequently I’d thought how wonderful it would be to catch the ancient churches and fortress on a clear, moon-bathed night. I’d also used my camera repeatedly and in the process learned how to take time exposures on a steady tripod by adjusting the aperture and shutter speed using either the camera’s internal timer to release the shutter or employing a cable release. Then, when the rare opportunity presented itself, I was ready. Nurture your photography skills and right when you need them, they’ll nurture you! More often than not, the skies above Salzburg are more like this view from the same general spot. I took this shot in November, 1976. I think there’s a spiritual lesson here. As I’ve preached many times, spiritual maturity and insight don’t come quickly. There simply is no rapid path to wisdom. The capacity to understand deeper spiritual truths and discern the presence of God come after years of struggle. Then, after we’ve walked the same path repeatedly, imagining possibilities and nurturing our fond desires, an opening occurs where one had not been previously. Since we’ve been steady in pursuing this spiritual path over the long haul, we’re present to perceive beauty where before it would have eluded us. This past March, I had one of the loneliest days I’ve experienced since I moved to Birmingham a year previously. I voiced a prayer at that point, a wordless inner intention – as the Apostle Paul said it – in groans that words could not express (Romans 8:26). Only a few minutes later, I received a text message from a friend in Richmond. He and a number of my Richmond friends were thinking about me, he said, and they wanted to know that they missed me. It was as if the full moon had risen over the ancient fortress of my heart, spilling a silver, silken beauty over the river of my soul. Yes, I’d nurtured those relationships repeatedly while living in Virginia. Yes, they gather every Tuesday, the same day I used to meet with them and this happened to be a Tuesday. Yes, the odds were that at some point, they’d send a text telling me that they missed me. But this timing was perfect – I hadn’t needed that text at any point like I needed it then. Mere coincidence? Nope. Nurture the community of faith and it will nurture you, right when you need it. I think that’s how God works. Where is God in the Loneliness? I’ve actually put off writing this particular post because, to be honest, I’ve grown increasingly reluctant to say that God does this or God does that, or point at an occurrence and say, “Look what God did!” Over the course of my years I’ve often said and done precisely those things only to have life teach me profoundly that I was mistaken. I promised, though, in the last post that I’d reflect on this question, so this is a small part of what I’m thinking at the moment, humbly offered. It’s true that things have worked out really well for me in the year or so since divorce ruptured my plans – and some would see that as a sign of God’s blessing my life. I’m slow to draw that conclusion, however, for at least two reasons. First, just because things have worked out for me doesn’t necessarily mean that the Creator of the Cosmos has taken a greater interest in me than in multiple other 60 year-old men (at least as deserving as I) whose lives have fallen apart at a very inconvenient time and who haven’t landed on their feet the way I have. And second, if God takes a minute interest in the details of my life, my ex-wife and I could’ve used some clearer insight back in our early 20’s as to her sexual orientation. That would’ve been a huge blessing for both of us. Alas, I do not believe that God micromanages my life. But, might it be that as I’ve grown older, I’ve grown more sensitive to promptings rooted in wisdom and improved in my ability to make something good emerge from my brokenness? Perhaps God DID present my ex-wife and me with the data that our marriage wasn’t going to be the best thing, but we were both too intimidated by the toxic brew of the cultural, religious, and family systems in which we were raised to brave the deprivation of blessing an authentic response would’ve entailed. You see, I believe that whatever God does, God respects our essential humanity and treats us as adults, even when we’re mistaken in God’s “eyes.” Flaws warp every human system, including even the best nuclear family. We inherit those flaws and our psychodynamics will always involve those flaws. Sometimes, we’re liberated from the more harmful traits of our systems. Sometimes wisdom gets through and we muster the courage to walk a less beaten path. A less beaten path, though, always leads through the desert that lies between the previous “captivity” and the anticipated “promised land.” Sure, the waves parted and I got through on dry land, but the wilderness is a lonely place, and I feel the temptation to flee back to “Egypt.” But I know I headed in the right direction when I embarked on the less beaten path. If I flee the loneliness now, I’ll turn my back on the promised land. Can you bind the shining Pleiades? 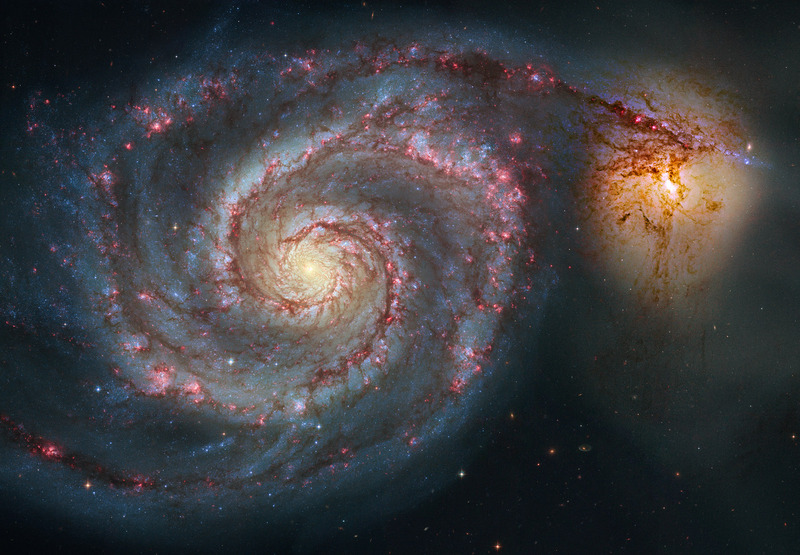 Can you loose the cords of Orion? or lead out the Great Bear with its cubs? Something eternal resonates in me every time I sharpen my awareness to the fact that I am a tiny part of a huge, magnificent, and ancient process. It’s not about me, so I’m not going to attempt to convince God to rearrange the details of my life so they appeal more to my predilections. Rather I’m going to focus on the more joyous and manageable task of changing myself so that wisdom might grow in my soul. Whenever I consider wisdom, God is involved in the process of my living. And then, there are those “coincidences” which seem to defy explanation – more on that in the next post.